The summer and fall of 1870 would finally find James and Jane reunited. It had been almost ten years since they had lived a quiet life in Corpus Christi with no thought of war on the horizon. Much had happened in those years. James had witnessed firsthand the bloody horror of battle and had taken upon his shoulders the responsibility of leadership and command. Jane had watched her home ravaged by invaders; her family put in constant danger and deprivation, and had taken upon her shoulders the weight of raising three children alone in a world that, at times, seemed like it had come to an end. They were no longer eager young newlyweds. They were both only two years away from turning 40 and they had spent the vast majority of their 14 years of marriage apart from one another. Their children (Fanny, Somerville, and Eudora) were ages eleven, eight, and six respectively. They had no memories of quiet Sunday dinners with both parents at home, and their father was a man they had only seen for brief times under stressful situations. It was going to be a surprising change for the whole family. I received yours of the 1st enclosing a line from your husband this morning. I was happy to congratulate you both on a reunion after so long a separation. And may it be long before another conflict of arms which would repeat your experience to others, if not to your selves. I hope you may be very happy. You know the interest I feel in all that, and so noble, plucky, and so determined are you and such can never fail. You know the interest I feel in your children and in your husband’s being exiled. I am quite pleased with your husband's letter. He certainly has had experiences in railroads that cannot fail to make him useful and which he can soon enterprise. When we begin to extend our road lines, we can give him a better situation than now. Our business has not yet begun but is in the eve of it. Will write Mr. Sealy today and hope, if Mr. Ware can accept a situation such as we have, to give him a place at once, but I fear we have not a place fitted to his intelligence and education outside of railroads. This information he can soon acquire and if he likes the business with the railroad enterprise in Texas, he can soon command the highest position. The weather has been oppressive here ever since my return – much warmer than I have ever experienced in? and my labors have been so tired that I am about ‘used up’ as we say in Yankeeland. Mrs. Curtis often speaks of you and wonders if the heat is as oppressive with you as her. She is very feeble this summer and unless she improves with the cold weather, I shall be very anxious about her. Had a letter from the doctor the other day not so cheerful as usual – glad to hear he is improving. I will write him soon as I get time and strength. Give my love to the children. How is Edith? I have six nieces at my house – all children – wish she could be with them. I wrote you about 3 weeks since. A month later, in September, they were still discussing the arrangements of employment for James. 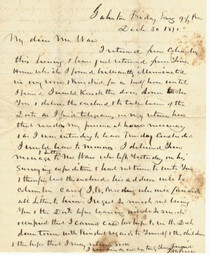 The couple was now residing in Galveston where it gave Jane a chance to help her elderly uncle who was ill. Mr. Peirce reassured Jane that, although he would be working more from his home back east, he would never sever his ties with his business partners and friends in Galveston completely. manifest it to the public. I know of no one who has so much energy and willpower as you. You cannot fail to succeed. I wish I had one or two assistants such as you - determined and industrious. I would be glad if the Doctor and the General would give me the surprise you intimate. I would be very happy to see them, busy as I am. We would have a good time and would like for you to enjoy it with us. About the Mexican laborers which Mr. Ware writes - I am confident there is - - any other to employ when we begin to build but which we shall have to postpone for the next few months. But the time for my train has arrived 6:00 P.M. and I must leave. Will write you again. In the meantime, let me hear from you. By the close of 1870, James had obviously been employed but, sadly, his job required him to travel a lot and still be absent from home. This was the case for many men after the war. 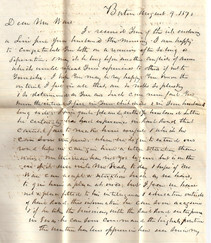 Mr. Peirce became the “go between” for letters that the couple exchanged because James seldom had a permanent address. 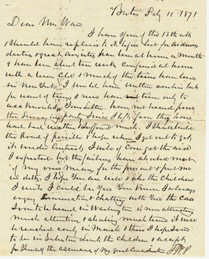 He mentions to Jane in the letter below that he had contact with James right before he had to leave on a surveying expedition and was able to give Jane’s letter to him. 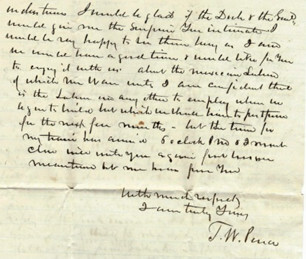 Her husband did not have time to write back himself before he departed, but it is clear that he requested Mr. Peirce to deliver something to her from him – in all likelihood a most welcomed pay check. 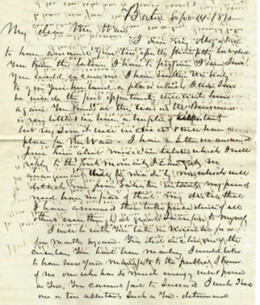 Peirce provides an address in Columbus where Jane could write in the future and have her mail forwarded to her husband. The old year ended much the way it had begun – with miles separating the couple again. 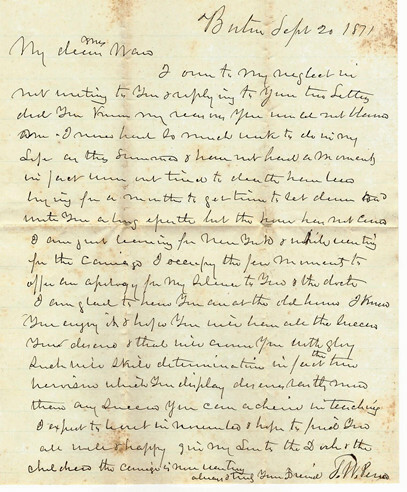 Galveston Friday Evening 9 � p.m.
From the sounds of the next letter Jane received from Mr. Peirce, which was dated February 11, 1871, the surveying expedition that James had been sent on kept him away from home for quite a while. Peirce even wrote that he was worried about them and assumed that they had encountered bad weather or much suffering. Once again, it was Jane’s lot in life to wait and worry. It also meant that she had not received any money from James for two months, so it was only her teaching salary that was keeping the family afloat. ** The case that Peirce was referring to in Washington was one dealing with the railroads. Wares. James and Jane had both decided to move back to their old home in Corpus Christi. The railroad business had obviously lost any appeal for the Wares after that last expedition, and one can be sure that Jane was very tired of worrying. James wanted to go back to his first love - the law profession. The coming months would open many doors in civic and political arenas, and James even served on the Democratic State Executive Committee – something he could not have accomplished if he had stayed with the railroad. 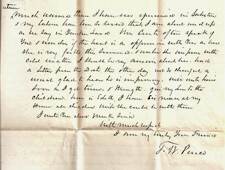 In the following letters from Peirce in March and September, he clearly wished them well as they made the transition. I own to my neglect in not writing to you and replying to your two letters. Did you know my reasons, you would not blame me. I never had so much work to do in my life as this summer and have not had a moment, in fact none, but tired to death. Nevertheless, trying for a month to get time to sit down and write you a long epistle, but the hour has not come. I am just leaving for New York and while waiting for the carriage, I occupy the few moments to offer you an apology for my silence to you and the doctor. I am glad to hear you are at the old house. I know you enjoy it and hope you will have all the success you deserve and that will cover you with glory. Such will, with determination (in fact, the true heroism that you display) deserves certainly more reward than any success you achieved in teaching. I expect to visit in November and hope to find you all well and happy. Give my love to the doctor and the children. The carriage is now empty.